Targeted basking shark fisheries still exist and huge numbers of basking sharks are accidentally caught in fishing nets worldwide. Unfortunately for the basking shark it has long been a fishery target as its one-ton liver is exceedingly rich in commercially valuable oils, and its enormous fins are used in Chinese sharks’-fin soup. Targeted basking shark fisheries still exist and huge numbers of basking sharks are accidentally caught in fishing nets worldwide.These accidental basking shark catches are often de-finned as the sharks’ fins command large prices. 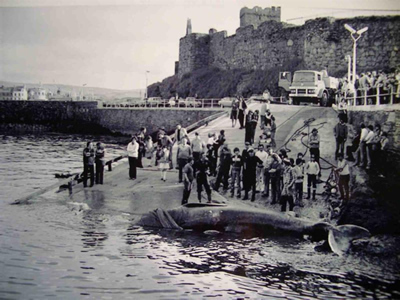 The photograph in the banner by Michael Craine, is of a basking shark that was accidentally trapped in nets off the Isle of Man. It was released but later died. When the basking sharks are feeding on the sea surface they are vulnerable to being accidentally caught in nets. This is a disaster for both the shark and the fishermen. 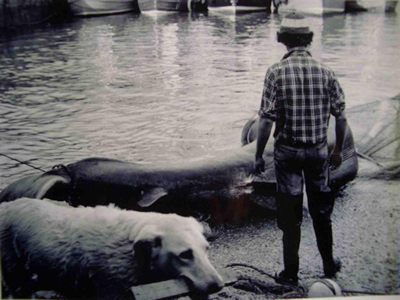 The shark normally ends up dead and the fishermens’ nets are often badly damaged. 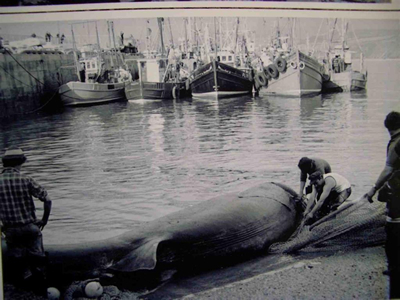 This used to happen a lot in Manx waters when there was a herring fishery but as this fishery no longer exists the only photographs we have are from the 1970 or early 1980s. These three pictures show a basking shark being landed in Peel, having been accidentally caught in nets. They were all taken by Scottie Keith in, we believe, the late 1980s. The fishermens’ body language says it all! Apparently a whole basking shark was recently displayed ready for sale in a French supermarket. Pictures of this were displayed on the web! Basking sharks grow to maturity late and breed slowly. These magnificent creatures are an important part of the complex ecology of temperate seas and should be protected. Laws may protect these magnificent animals in parts of the world but deep-rooted attitudes need to change before their world-wide exploitation can be effectively halted. 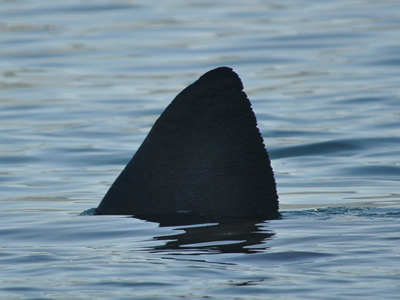 Dried basking shark fins are used to make sharks’-fin soup. The enormous dorsal fin can command huge prices in oriental fish markets.